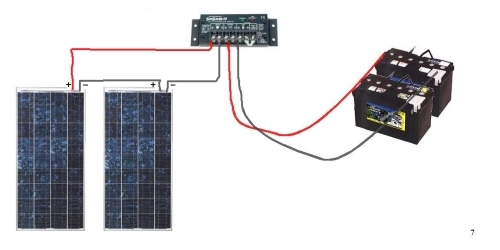 Since off-grid solar panels are usually setup for 12 volt charging system, if you have a 24 volt system, you will need to wire two panels in series in order to generate this voltage. Connect the positive terminal of one solar panel to the negative terminal of the other panel. You do of course have to make sure that your regulator is rated for 24 volts. Basic regulators such as the 5A LandStar are generally only available in 12 volt versions. We do however sell plenty of solar charge controllers that can charge a 24 volt system. We have models that can charge both 12 or 24V systems, such as the SeaStar regulator, and larger regulators such as the MorningStar Tristar range can be configured to run on either 12, 24 or 48 volt systems, while the Victron units have automatic battery voltage recognition (12/24V).